Or is that ‘Life Drafts Can Be Rough’? I’m kidding – I enjoyed the format, I’m just bending the truth for the sake of a catchy title. (Well, catchier at least, in comparison to my earlier versions). Here’s my take on last week’s Life Draft Event. The rules for it were listed by Jourdo here. This wasn’t a team as such, just a bunch of cards I liked or thought would be amusing to bring. 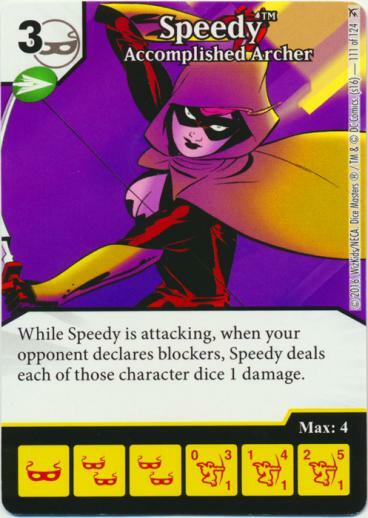 I felt like bringing a Supergirl card, and the OP has my favorite artwork of any of those cards (even if the ability is meh, and the cost is discouraging). FUS Ring as an ‘energy fixer’ of sorts – more expensive than the ‘normal’ energy fixers but also more versatile. Hal Jordan as a cheap crossover character and potentially a useful counter to R Grodd or R Merlyn. I’ve used R Speedy in a couple of teams, she can be useful in the right circumstances. Namor has decent punch, and isn’t too difficult to make unblockable. 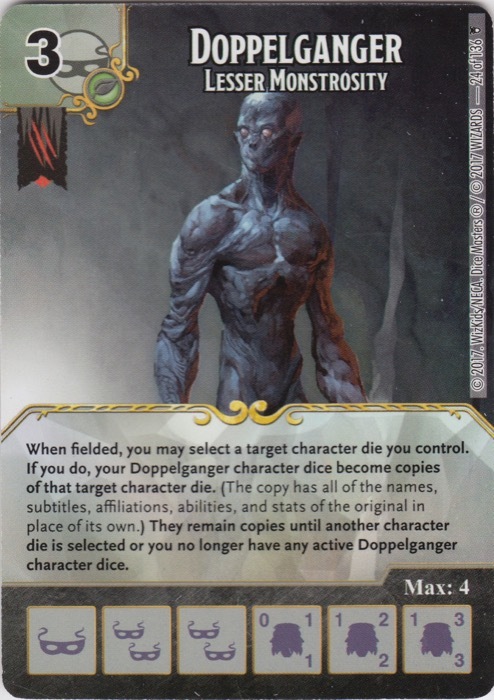 C Doppelganger – take your most dangerous character, and make extra copies of him/her/it. Finally, a couple of one time favorites (talking generally here, not just for myself) that have fallen out of fashion – C Kryptonite and C Elf Thief. My thinking was with 56 points to bid, if you wanted to start with the normal 20 life you’d spend 36 on 8 cards. That works out to an ‘average’ card being worth 4.5 points. My first five purchases all cost 3 or less. None of them were anything I desperately wanted, but I was okay with getting them for cheap. First was Michelangelo (3 points) – bid on him mostly because the player 2 seats down from me already had Metalhead, and I didn’t want him getting cheap Turtles. Next was R Speedy (3 points) – A useful ability, at least when combined with Overcrush, and there are plenty of BACs around allowing one to do that. C Kryptonite (3 points) – Blanking can be useful, even if character based blanking is a lot more useful than action based. Leonardo ( 2 points) – Well, maybe he and Michelangelo can make each other a little bit cheaper. C Hush (1 point) – Sometimes you draw a card nobody else is interested in, and you end up paying 1 point for him/her/it. At least, as a 3-cost its affordable. 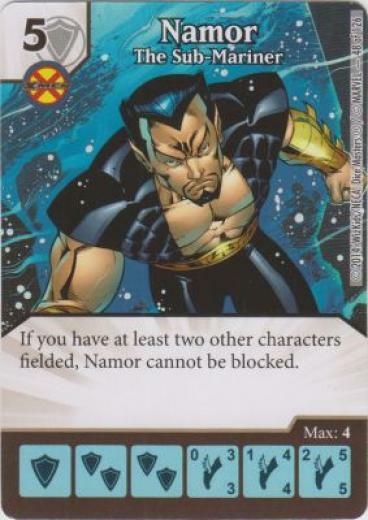 C Namor (5 points) – With only three slots left, and nothing really resembling a win condition, I decided this was something I needed to bid a little bit on. It would at least give me something with some actual offensive potential. C Two-Face (2 points) – Quite a bit of trolling in the card pool this night, in the sense that people would bring different versions of one-time popular meta cards. In this case C Two-Face instead of the much more dangerous UC. Still, 2 points for the C didn’t seem like a terrible deal. C TOA Doppelganger (10 points) – This being my last slot, and my team so far not being overly impressive, I let myself get into a bidding war for the first (and last time). Doppelganger can be such a useful character. That left me with 27 life to start each game. For BACs I went with Thrown Car (since I was running R Speedy I wanted potential access to Overcrush) and Create Food and Water as a potential ramp option. Lacking Jourdo’s forethought, I didn’t note down every card on my opponents teams. This team did most of its damage with the Stick that can’t be blocked by characters of a lower level. It also had Captain America: Chemistry Project and the blank crossover Hal Jordan. He was running With Great Power and Thrown Brick as his BACs. He started at 31 life. He’d been planning to buy a Hal Jordan die or two early but couldn’t get both of the needed energy types at the same time on any of his first three turns. He turned to buying Sticks and did a lot of damage with them, since they had this annoying habit of coming out at Level 3, while I couldn’t seem to roll any Level 3 characters. Eventually I managed to roll some Level 3 characters to block Stick with. He’d bought a couple of Captain Americas, but found the weren’t really a win condition without Kate Bishop/Distraction as I’d simply block with enough to KO him. My early purchases were one of my Turtles and Doppelganger. Then I purchased a couple of Namors. I was able to deal some serious damage with them, but not enough to retrieve the situation before time was called with him still far enough ahead on life that I had no way of retrieving the situation. His starting life total was 8. He included Pizza and Power Bolt as his BAC’s. I won the coin toss and used that advantage to buy 2 of the 3 Power Bolt dice. He bought the other Power Bolt and all 3 Pizza dice. I’d keep hitting him with Power Bolts, and he’d use Pizza – both the action and the global – to gain life. I got him down to 2 life quite frequently, and occasionally even 1, but I could never quite finish him off. I’d bought Doppelgangers and Namors, but ran into the problem of when Doppelganger has copied Namor he doesn’t count as one of the other characters needed to make Namor unblockable. Between fallible memories and the fact I was using a foil version of the Doppelganger card, making the wall of text quite difficult to read, we messed up the end of this game. I fielded a Doppelganger die and didn’t copy anything with it, which we thought gave me three different characters in the field – Doppelganger, Namor and a Sidekick. That would have made Namor unblockable which allowed me to do enough damage for lethal. The problem was, if you read Doppelganger’s ability, when I named Namor all my Doppelganger dice were Namor dice until I named something else. I did have a Hush die in my bag when the mix up happened, and If I was able to land it on a character face, I probably would have won the game when I drew it, but I still prefer my wins to be untainted. His BAC’s were Resurrection and Candlekeep. I won the ‘coin toss’ and used that advantage to buy two Candlekeep dice. On his early turns, he bought a couple of his Guy Gardner dice. Then he had them both come out on Level 3, with 2 Sidekicks in his field and sent them through my empty field for 16 damage. 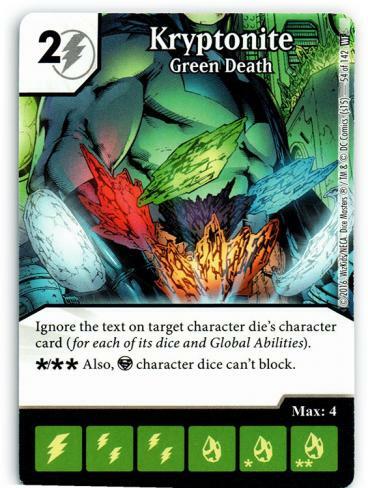 Since that had worked so well for him, he bought the other Guy Gardner dice and used them to finish me off embarrassingly quickly. I hadn’t seen Guy Gardner: Blinding Rage used for a while. This game was an unpleasant reminder of how hard and how fast he can hit. I enjoyed the format, but if you try it yourself be prepared for the Draft portion being time consuming – much more so than a Rainbow Draft. One idea I would want to think about if we do this again is to start with three or four cards ‘face up’. Player A must choose at least one of those cards and bid at least 1 Life Point for it. That bidding round continues until somebody wins the card. Player B selects one random card to be added to the pool of ‘face up’ cards, then selects the next card to be bid on. Etc., etc.